Damascus, SANA- Syrian national reconciliations are the most successful example to follow on the international level despite all obstacles facing them, on top the attempts of the hostile countries to distort this project and their continued support to the terrorist groups, State Minister for National Reconciliation Affairs Ali Haidar said on Wednesday. 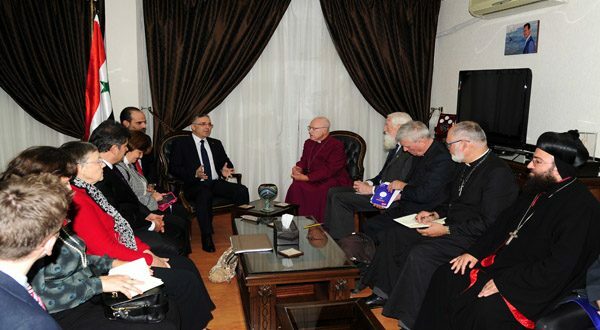 Haidar’s remarks came during his meeting with the House of Lords and the Anglican Church delegation. Haidar added that the success of the national reconciliations basically depends on the victories achieved by the Syrian Arab Army and on making the reconciliations a national culture and a popular demand. He underlined the importance of the visits paid to Syria by European delegations to get acquainted with the reality of what is taking place in the country and to be able to convey a true image to the public opinion in their countries. “Some of the European governments, mainly the British one, are still hindering the political process in Syria and imposing unjust siege on the Syrian people under the pretext of defending their rights,” he clarified. Haidar presented a briefing on the mechanism of the reconciliation’s work and the future work plan, asserting the connection between the tracks of combating terrorism and of the reconciliations. For their part, members of the delegation expressed solidarity with the Syrian people in their war against terrorism which is backed by some regional and Western governments. They warned against the huge danger of terrorism on the European states, expressing readiness to exert all possible efforts to convey a true image about what is taking place in Syria to the public opinion in their countries. In a press statement following the meeting, Minister Haidar reiterated the importance of the delegation’s visit to Syria. In turn, member of the House of Lords of the United Kingdom Baroness Caroline Cox hailed the reconciliations achieved by the Ministry, extending congratulations to the Syrian people on the victories achieved over terrorism. Cox highly appreciated the resilience of the Syrian people over the years of the terrorist war launched against their country.